We were very excited to introduce Dually at last year’s World of Concrete. But nothing makes us happier than seeing LTM products used in the real world. Ryan Lakebrink has more than 25yrs in the concrete industry and is the owner of Lakebrink’s Custom Concrete. 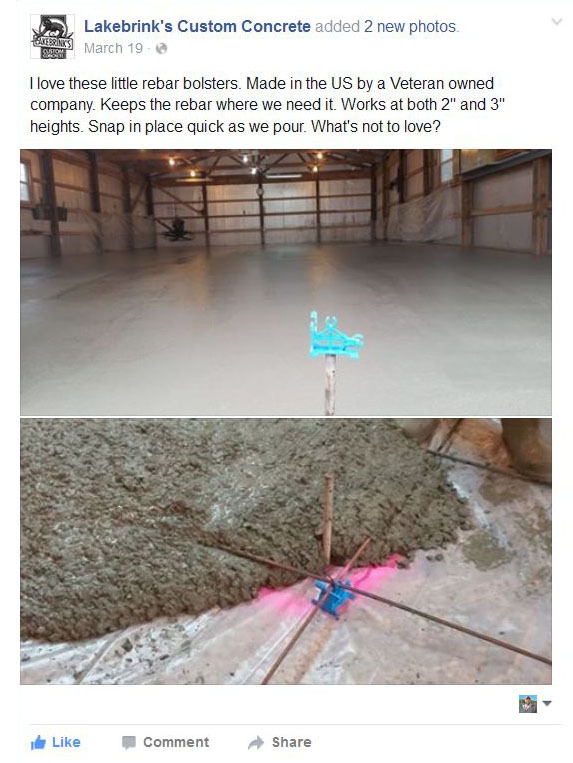 He chose to use Dually in his projects because it’s extremely versatile and keeps him from stocking multiple rebar support skus. Earlier this year, Ryan took to Facebook to show his appreciation for this innovative new tool. If you poke around his website and FB feed, you’ll see Ryan has got a serious eye for detail and would never compromise quality for price. This guy really does some beautiful work! We’re proud to support Lakebrink’s projects and would love to see what you can do with LTM’s supports!